The last time I drove Nissan’s brawny Titan XD pickup, it felt like trying to wrangle a mountain. If you want a truck that can haul your whole family while pulling geologic features behind it, well, that makes sense. This time, my big-truck tester felt much more manageable because it didn’t come with the four-door, SUV-like Crew Cab layout. Instead, this one was a King Cab with rear-facing back doors and a smaller back seat that’s useful in a pinch. The difference between the two is striking. The smaller King Cab felt dramatically easier to maneuver into tight parking spots and drive through city traffic compared to the lumbering Crew Cab. 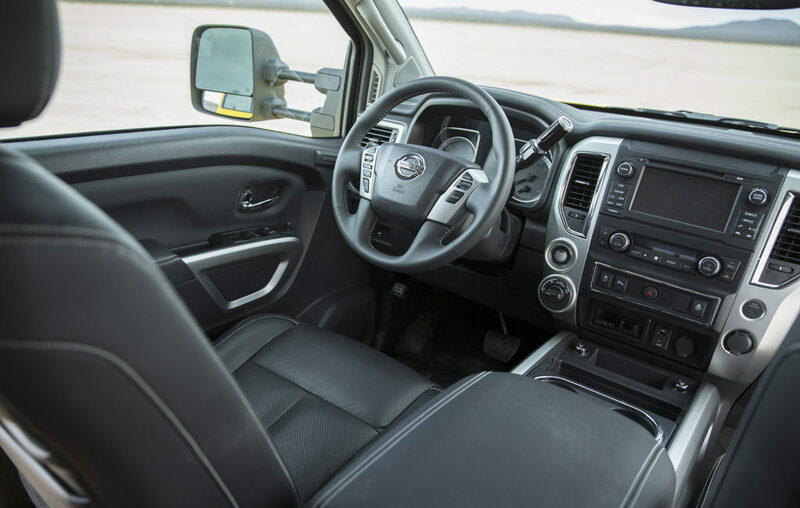 After only being available in the huge Crew Cab configuration at its launch, Nissan has now added King Cab and Single Cab models as more affordable and maneuverable options in the Titan XD lineup. The five-year, 100,000-mile policy offers longer protection than most trucks, a strong selling point in a highly competitive and traditionally brand-loyal market for pickups. My XD tester was outfitted with a Cummins V8 turbo diesel engine, a perfect fit in a truck designed for towing heavy loads. Not only does it have the reputation for durability that comes with the Cummins name, but it also operates surprisingly quietly — as long as you keep the windows rolled up. The sound-dampening in the Titan works wonders for what sounds like a relatively noisy, uncouth, built-for-work engine from outside the truck. Inside, it’s shockingly silent, even under heavy acceleration. The 5.0-liter Cummins diesel V8 makes 310 horsepower and, more importantly, 555 pound-feet of torque. If you don’t want or need the diesel, a 5.6-liter gasoline V8 is available. Paired with a seven-speed automatic, the gas powerplant delivers 390 horsepower and 394 pound-feet of torque. Aside from the capability and confidence that comes from driving a big, purpose-built piece of towing machinery, my favorite part of being behind the wheel of this truck is how the transmission feels and sounds when it shifts. Every gear change is quick, smooth and precise, something very unusual for big trucks. The six-speed Aisin automatic works brilliantly to deliver power to the wheels in a controlled, predictable fashion. The Titan XD has a straightforward, easy-to-use interior with large, clearly marked buttons and switches. Contrasting stitching and chrome trim gives it an upscale look on top trim levels. 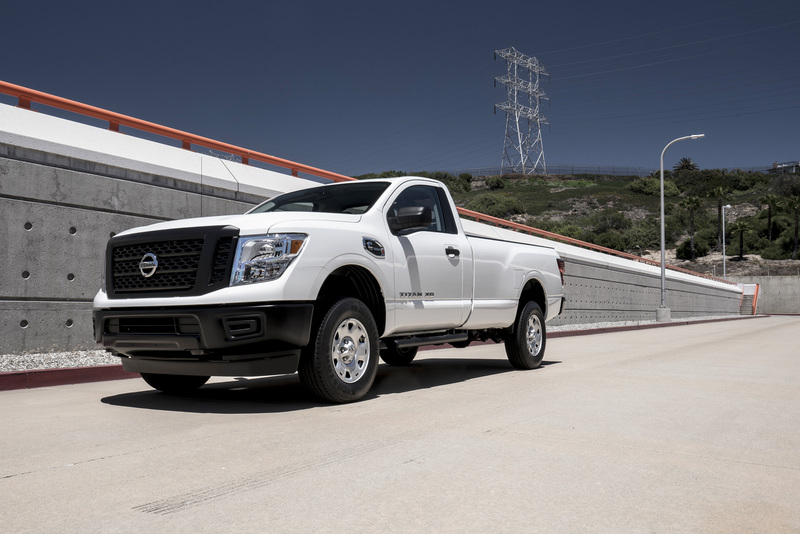 As a relatively fresh truck platform, the Titan XD offers the kinds of tech features contemporary buyers expect. And, predictably, many of them are centered around towing: an integrated trailer brake controller, trailer sway control, and a tow-haul mode with downhill speed control. One of my favorites is an ingenious system that makes it easier to check that the trailer lights are working correctly without a helper needed. You can use the key fob to activate all the trailer lights in sequence to verify they’re operating. After rolling out the huge Crew Cab first, in late 2016, Nissan expanded the lineup this year with Single Cab and King Cab variants. It also beefed up the options list with five new packages that let customers change the look and capability of their truck, ranging from towing enhancements to leather and chrome appearance choices. Pricing starts at $31,590 for a Single Cab model in the base S trim. The King Cab starts at $33,560, while the huge Crew Cab rings up at $36,790 with the gasoline V8. It’s a solid, capable truck with a long warranty for confidence.